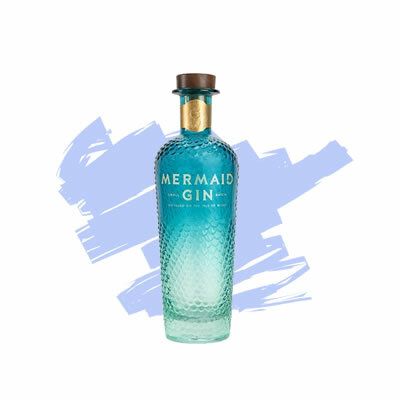 Mermaid Gin is an infusion of carefully selected botanicals including juniper berries, rock samphire that is hand-picked from the Island’s chalk cliffs and Boadicea hops grown at the famous Ventnor Botanic Garden. Along with English coriander seeds, fresh lemon zest, angelica root, liquorish root, orris root, elderflower and grains of paradise. Our rock samphire, known as ‘Mermaids Kiss’, is locally foraged from the space bewtween the sea and the shore, the world of the free spirited mermaid. Elderflower and Boadicea Hops are hand picked on the island. A father & son partnership source the other botanicals, visiting families and farmers around the world. This way we know we are selecting the best quality, ethically traded ingredients, gluten free and vegan. Mermaids are instinctive free spirits. In contrast, our master distiller is obsessive. Working with column stills for a smoother spirit, the process is tightly controlled capturing only the hearts of each batch – the sweet spot of any distillation. This avoids the harsher elements found in the heads and tails to create a purer Gin that is perfectly balanced. Mermaid is then rested for seven days to let the flavours mellow and marry and only then cut back to 42% abv with pure island spring water. Smooth, refreshing and complex with a contemporary style. The bouquet is fresh citrus, sweet spice, gentle juniper. The palate reveals citrus zing with a peppery spice – an earthy sweetness and a hint of sea air. Long, layered and complex with a well-rounded mouthfeel on the finish. Fill a glass with ice, a generous measure of Mermaid Gin and just a splash of Fever-Tree tonic. Garnish with juniper berries, a sprig of samphire or a ribbon of cucumber and let the smooth and complex flavours shine through.